BC Checker is a diagnosis system developed by Future Wave, Inc. You can check your accelerated plethysmogram(A.P.G. ), the condition of your blood circulation in a peripheral blood vessel by BC Checker. All you have to do is to put your fingertip on the red point of BC Checker. It takes more than twenty seconds to measure. It's very easy and safe. Many Japanese medical doctors have studied A.P.G. for preventation of arteriosclerosis . 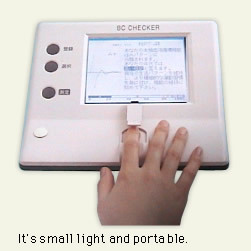 BC Checker is the wellness PC in 21th century.